The 11 to 15-year-old riders of the junior class are no longer beginners. These are future champions fighting for victory, no matter if it is the for a National Championship or a local qualifier. In this scene, the new and improved KTM 85 SX is considered a winner's bike. With the most powerful engine in the field and a super lightweight, stable chassis, it does not need to shy away from a full size bike. BODYWORK & GRAPHICS: The bodywork on the 2019 KTM 85 SX was designed to have the same touch points and overall feeling as the full size SX range. This similarity in bodywork is great preparation for an 85 cc rider's imminent move to the bigger bikes of pro-level motocross, making the transition as seamless as possible. KTM factory riders, KTM R&D and Kiska Design all contributed to achieving the goal of complete harmony between rider and bike. These contact points allow maximum freedom of movement and improved agility. The front and rear fenders have an I-beam structure, which are prime examples of the intelligent design that produces maximum stability with the lowest possible weight. The bodywork is fittingly finished off with aggressive, modern graphics, leaving the competition in no doubt of a rider's race-winning intentions. CHASSIS: For the 85cc, KTM has successfully developed a chassis that not only handles the hard charging brutality of a 15-year-old, but also effectively accommodates a lightweight newcomer to the class. This is effectively achieved through its lightweight, high-tech steel frame. It has optimized flex characteristics that provide a great feeling for the rider and help to soak up those big hits, while also delivering excellent agility and high-speed stability. Every element is designed to work in perfect harmony and contributes to an intuitive ride like no other. FRAME: The frame on the KTM 85 SX is a scaled down version of the championship-proven full-size frames. It is professionally crafted using hydro formed Chromium Molybdenum steel tubes that are robot welded, ensuring the highest levels of consistent quality. The flex characteristics have been specifically tailored for easy handling and optimal comfort, while working in perfect harmony with the suspension, to ensure excellent agility and high-speed stability. The frame also features "no-dirt" footpegs which have a simple but effective self-cleaning system that ensures the footpegs return to their original position, providing complete control in all conditions. For 2019, the frames feature the same highly durable orange powder coating as the KTM Factory Machines and come with standard frame protectors. SUBFRAME: Made from lightweight aluminum, the new subframe features a shorter and more compact profile. It is now 75mm shorter and 0.2kg lighter, which not only contributes to the overall weight reduction but also improves mass centralization. WHEELS: Black Excel rims and CNC-machined hubs ensure the strongest base of forward momentum on the KTM 85 SX. Maxxis tires have been fitted to deliver exceptional straight-line stability and excellent traction on a wide variety of terrain, ensuring the power ends up where it is intended – on the ground. 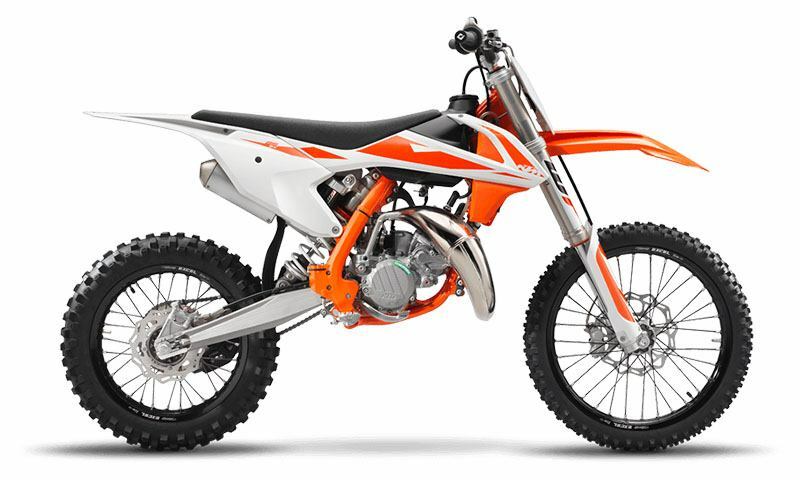 FRONT SUSPENSION: The KTM 85 SX front fork features the same suspension technology found in the full-size motocross range. The WP AER 43 consists of a split fork design with a capsuled air spring in the left leg and the trusted oil damping system in the right leg. It offers a significant improvement in suspension performance with a massive 1.0 kg reduction in weight over conventional spring forks. Importantly, the preload adjustment is extremely simple and can be done by using the single air pressure valve and supplied air pump. The design also allows for easy access to compression and rebound clickers. REAR SUSPENSION: The KTM 85 SX features a WP Xplor PDS (Progressive Damping System) rear shock absorber. The design offers a high progression rate and excellent response. It provides the wheel with a total of 305 mm of travel and is fully adjustable for preload, compression and rebound. BRAKES: The Formula braking system with radial calipers – four pistons in front, two in the rear – with lightweight wave brake discs – front 240mm diameter, rear 210mm – are the ultimate in terms of controlled action and braking performance. AIRBOX: What is good for the bigger KTM off-road bikes cannot be bad for the 85 SX: an air filter change can be done within seconds without tools. ENGINE & EXHAUST: It took the highest levels of ingenuity to fit the race-winning formula of KTM's bigger 2-strokes into a compact 85 cc engine. A special manufacturing process is used and provides impressive weight savings without sacrificing strength or durability. The super compact power plant is fitted with a 6-speed gear box and delivers class-leading power and rideability throughout the entire rev range. The power valve plays a key role in tailoring power delivery to suit track conditions and rider ability, making sure the only rider surprised by the incredible performance is the competition. CYLINDER: The cylinder on the 2019 model has a bore and stroke of 47/48.95 mm. It features a sophisticated power valve system, which controls both the exhaust valve and the sub exhaust ports, giving the bike excellent torque, power and power delivery. This translates to significant midrange performance, reducing the need to overwork the clutch in loamy or sandy conditions. An adjuster screw allows the opening time of the power valve to be adjusted to suit rider preference and track conditions. Further refinement can be made by changing between different power valve springs (available in the KTM PowerParts catalogue), which adjusts the rate at which the power valve opens, making the power hit harder or smoother, depending on preference. CRANKCASES AND ENGINE COVERS: The crankcases are manufactured using a high pressure die-cast production process, keeping wall thickness to a minimum while retaining strength and durability. The design of the cases is very compact and aims at positioning the shaft arrangements as close as possible to the center of gravity, contributing to better handling. TRANSMISSION: The 85 SX features a light and robust 6-speed gearbox. The gear ratios have been developed to perfectly match the characteristics of the engine, while easy and precise shifting allows the rider to select the next gear quickly and confidently. Another highlight of the 85 SX transmission is the no dirt gear shifter. Similar to the footpeg design, it prevents the build-up of dirt and ensures the next gear is always available, no matter what the conditions. CLUTCH: The hydraulic clutch mechanism by Formula ensures an easy clutch action and well-defined modulation on the KTM 85 SX. Replacing the previous coil spring design, the KTM 85 SX features a new diaphragm spring clutch. The new design is 0.4kg lighter, more compact and also benefits from added durability. CRANKSHAFT: The KTM 85 SX features a lightweight crankshaft with optimized balancing for reduced vibration and oscillating mass. As light as the crankshaft is, the rotational inertia has not been compromised, ensuring maximum torque and revs, as well as easy ride-ability. COOLING: A constant temperature balance for consistent, high performance is ensured by an intelligent cooling circuit with integrated crankcase cooling and two radiators. It routes the coolant from the cylinder head through the frame triangle, directly to aluminum radiators made by WP. Thanks to flow optimized internal circulation and CFD-calculated ventilation, the system is superbly efficient. In addition, new radiator protections improve heat dissipation. Especially in the mud. They are also integrated into the front part of the shrouds to protect the radiators in a crash. EXHAUST: The exhaust system has been designed to perfectly match the engine's power characteristics and contributes to the outstanding all-round performance and ride-ability. The header pipe is using a 3-dimensional stamping process. Once the components have been shaped, they are robot welded to ensure the highest level of quality, consistency and durability. The lightweight and compact silencer guarantees that sweet 2-stroke sound and falls safely within the FIM noise limits. ERGONOMICS & COMFORT: 85cc riders come in all shapes and sizes and require intelligent motorcycle design to deal with their wide range of dynamics. For optimal high-performance ergonomics, KTM used the proven design of the big bike range on the KTM 85 SX. The goal was to provide a neutral riding position that, together with perfectly shaped bodywork, offers the best rider comfort and maneuverability. A rider's main interaction with the motorcycle comes through the seat, footpegs and handlebars, which is why KTM has used the best quality parts in these areas. The placement of these crucial contact points is also vitally important for balance and control and, through various handlebar position options, can be adjusted to suit a rider's preference. This ensures the optimal riding position for race-winning performance. HANDLEBAR: The KTM 85 SX has a super strong, tapered handlebar made of high-quality aluminum alloy with a bend that’s perfect for motocross requirements. They get a new throttle assembly that allows for easy free play adjustment. ODI lock-on grips on the left side make grip changes easy and do not require any wire or glue to be secured. SOFTWARE & ELECTRONICS: Absolute performance purity is the name of the game when it comes to electronics and the new KTM 85 SX. Undiluted 2-stroke simplicity with an hour meter to keep a check on how long you've been shredding and an optional rev counter to assist with perfect setup. Chain - 1/2 x 5/16 in.